When the Waverley dowsers started planning to visit and dowse the 11th century Waverley Abbey in Surrey it was decided that it would suit everyone if we had some of the most experienced Archaeological dowsers in the country as part of the investigation and surprise of surprises we also had two Mayors who accepted an invite to visit and observe at the same time. The Waverley Dowsers Chairman, Michael Haxeltine is a great organiser and planned to tackle the site with teams of dowsers each giving a particular task and area to investigate so that we would end up with some tangible results that could be pulled together to provide something that the archaeologists couldn’t provide. So the teams were all charged to investigate the large Church that had once been on the site, so we had teams investigating the physical structure of the building that had once existed, this is the great thing about dowsing, because the energy shadow remains long after the building has been removed from the surface and sub-surface of its location. So finding the Altar and the Altar area, identifying where the priest would usually stand to deliver sermons and the spot where blessings would be dispensed can only be achieved through dowsing. So we had the Chairman from the British society of dowsers Archaeological special interest group ‘Don Bryan and his dowsing partner Edwina Cole… ‘ investigating the physical area of the Altar and we had myself and several other dowsers checking and confirming the energy ‘hotspots’ when identifying the sermon position and the blessings area while Don Bryan and Edwina concentrated on the physical layout of the Altar area. 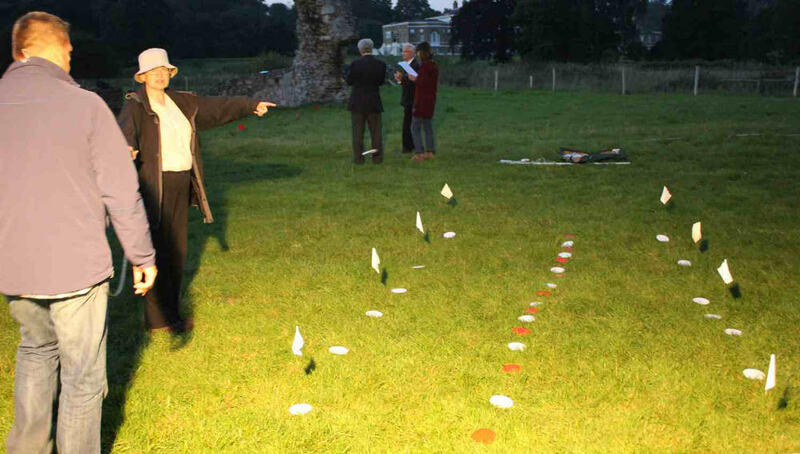 Don & Edwina dowsed the altar area and marking with flags and markers, in photo is Steve, Celia, Nadia and David. but if you look at the diagram below as well, you will see that Don had dowsed roughly the perimeter wall of the Church, (marked in hand drawn pen) the Altar plinth and Altar base itself which sat on top of the plinth along with the two ascending steps are marked and labelled. At the back of the main Altar Don and Edwina had found that there had been five additional side Chapels and Altars, this layout is not unusual as the Abbey would have been dedicated to certain Saints and it was usual to have an Altar specifically dedicated to the saint where people can make offerings of prayer or donations, these five small side chapels were made of stone. We had another team led by Sue Wilson who had been investigating the nave area and during their investigation they not only found the location of the Rood separating the North transept from the central body of the Church, they also discovered the energy line or track that came through the centre of the Rood and went straight to the location at the front of the Altar plinth area before twisting of to the left, this was given a certain amount of assumption as an energy line laid down by the hundreds probably thousands of feet and people who had walked the same line or path through the Church and up to the Altar area for their blessing over the centuries. This is something that dowsing is particularly good at, finding the energy paths left behind by people (as well as animals) over a well trodden path, for those who understand the potential of the Quantum universe, the discovery of ‘old’ energy would be completely understandable as well as how dowsing works is pretty much covered in the understanding. We had another team looking at the North Transept consisting of David and Nadia and trying to pin down how many windows this area once had, and how big they all were, everyone also identified where the pillars and plinths had been located in their particular areas of investigation. The Waverley dowsers evening was charged with producing an interesting evening for our two local Mayors, the Town Mayor of Godalming was Councillor Andrew Wilson and his wife Jocelyn and we also had the company of the Mayor of Godalming Councillor Liz Wheatley and her consort for the evening who all seem to get a fast paced and perhaps slightly bewildering (at times) but we hope an exciting two hours. The two Mayors were escorted by the Waverley dowsers secretary Celia and one of its most experienced dowsers Steve, many times I saw them walking about holding their dowsing rods and seeing the rods turn in their hands there was a few sceptical face’s at the beginning but the Mayors showed their commitment by retracing their steps to see if the reaction of the rods in their hands was replicated, it was. It was pleasing to hear the comment “now I want to dig down to give myself definitive proof that there really is something in the ground” was one cheerful comment I overheard, because you can’t argue when the dowsing rods keep turning in your hands time after time against all your better logical judgement, logic tends to crumple in dowsing practise. I myself had visited the site the previous weekend to dowse the site for anything interesting that wasn’t connected to the bricks and mortar of the site. I discovered an energy line that entered the site at a 45 % angle from the lake and striking the north right corner of the North Transept and ran along/under the outside wall before diverting off to head for the centre of the Altar but near the front area (see the video where I retraced the zig-zag path below) the real question would be, did the builders know the energy line was there and built the buildings to accommodate and make use of the energies or was it all totally coincidental. The energy line zig-zagged through two doors and two windows that were still visible and one door that no longer existed. An interesting fact was that when I dowsed the line beyond the second doorway on the night of the Waverley visit which was ten days later, the angle had changed, instead of entering the first window in the Monks living area and out the opposite window, it had changed and the energy line approached from a slightly different angle and entered through the second window (see video) and out it’s opposite window, the only difference between my two visits over the ten days was that there was almost a full moon on the night of the Waverley Dowsers visit. With further questions asked, it seems that this energy line was likely the ‘path’ taken by multitudes of people in ancient times walking the same path over many years. I’ve given up being nervous about anything now so Press Liaison is fine by me! Jennifer starts by saying she may have to dash off early due to commitments. While everyone else was busy scurrying about locating altars and doorways I’m asking Jennifer for any prior knowledge of our subject. No?… Well, that is good in a way. She wanders around looking at what others are doing, while I set up some floodlighting, it will be dark at 8 o’clock so we only have an hour of daylight left. I gave Jennifer some short dowsing training “this is a rod and this is a pendulum” (complete with a demonstration of what to expect when a object is located or question answered) “Hold the rod up, get it stable” and say “point to my nose” Usual hesitation and the expectant slowing of my life’s clock; slowly it moves around and points to her nose; much relief for me; wonderful surprised look from Jennifer! We progress further and find the edge of a now hidden wall foundation, We chat about the mechanics of the system, Jennifer is lucky in that, because of my relatively novice status, I can’t get too heavy on the subject! Soon Mike gathers us around and explains what has been found and some of the fine detail that dowsing has revealed. Each section reports in, about what they had dowsed, what doorway and what window had previously existed. We are invited back to a local office conference room for a debrief. I thought I’d lost Jennifer in the transfer, but she is still with us which was a surprise, it had been a busy but interesting evening. Mike thanks the Mayors and everyone for attending and hopes that we have wetted their appetites. Jennifer has to leave now she is late, I was surprised that she was interested enough to stay so long.